After a boat ride and a short hike up to Inspiration Point at Jenny Lake, we depart Grand Teton National Park and Wyoming for Craig, Colorado. This takes us most of the way to Rocky Mountain National Park, where we head tomorrow. Since we had to pack up this morning, this was disappointing. It became downright frustrating when I realized that water was inside the tent again too, and that all of our damp towels left out to dry overnight were now quite soaked instead. I did not expect rain to be this much of a problem out West where summers (I thought) were mostly dry. Most of all I was beyond irritated with our tent. Every time it rained, water got inside. I really expect any tent I own to do two major things: 1.) keep me warm, which this tent was not great at, and 2.) keep me dry…major fail. I came to find out later that you’re supposed to seal these things at least once a year. (You’d think they’d put that in the setup instructions!) And maybe it’s unrealistic on my part to expect a three-season tent to be all that warm. So with a soaked tent and soaked towels, packing up was going to be a drag. I picked up the driest towel I could find and started wiping. I still saw water droplets. Our entire rainfly was also wet on the inside…condensation from our breath in the cold air. We could probably pack everything up now and dry it off in Craig, but I wasn’t fond of having a damp tent in the car all day long. Tonight’s rain potential had also inched up from 0% to 10%. Awesome. Ten percent seems to be all it takes this summer. The best course of action seemed to be to leave the tent up to dry here for a few hours. This meant an extra hour of driving from Colter Bay to Jenny Lake and back from our hike, and tacking on an extra 30 minutes to our drive down to Craig. And checkout time is at 11am. Bummer. By around 7am we had everything but the tent packed up, and we were on our way to Jenny Lake for one last hike before leaving Grand Teton National Park. Yesterday the plan was to take the shuttle boat across and hike up into Cascade Canyon. Since we had a 6-7-hour drive ahead of us, we’d do an abbreviated version of that this morning. The shuttles run 10 minutes apart, so I guessed it must take just under 10 minutes to cross the lake. With a 30 minute drive back to Colter Bay and another 30 minutes to dry off and pack up our tent, I estimated that we needed to be on a boat back a little before 10 o’clock. This would give us about two hours to hike—not a ton of time, but hopefully enough! Along the way, I saw a sign for North Jenny Lake and a scenic drive. I remembered seeing this one-way road along the lakeshore on the map. Being impulsive and curious, I decided to check it out. It was a pretty little drive with a few pullouts and OK views along the lake, but it wasn’t anything seriously impressive like I’d hoped. My mind was wandering anyway…I kept thinking about whether we shouldn’t see about a late checkout to give us a little more time on the trails. The light was beautiful, so I couldn’t pass up a quick stop at Willow Flats Overlook to capture a high-resolution panorama. This can be printed HUGE, since the original is 24817 pixels x 8272 pixels. The low-hanging clouds looked so cool! 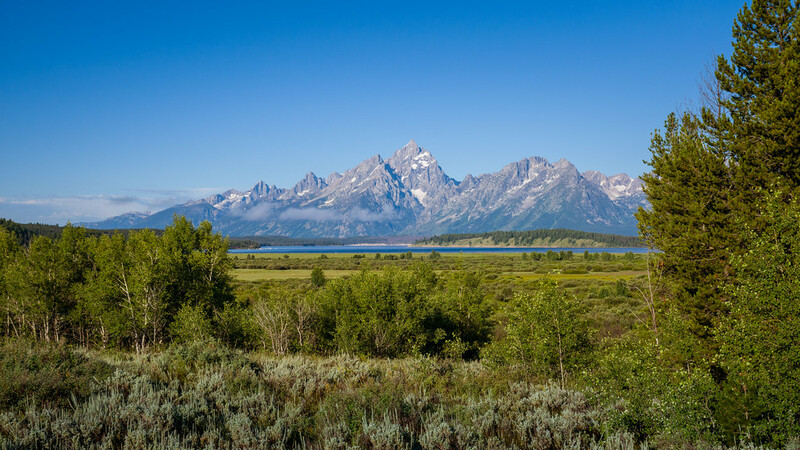 I also grabbed this shot with a clearer view of Grand Teton. 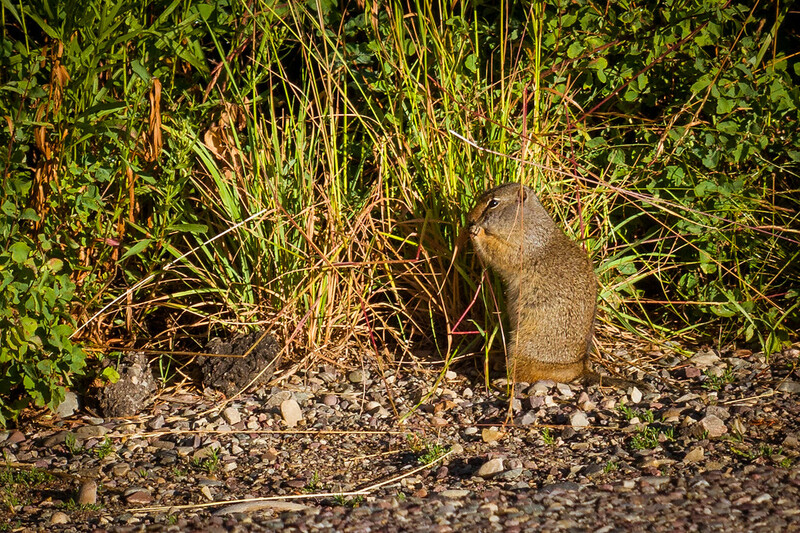 This ground squirrel foraged around the fringes of the parking lot at the Willow Flats Overlook. Parking at the Jenny Lake Visitor Center was a breeze when we arrived at 7:50! Coming in yesterday just before 11am put us at the peak of the crowds. Of course, it was time for me to hit the restroom again. Becky also wanted to comb the gift shop one more time to find a “Jenny Lake” souvenir for her best friend, Jenny, back home. 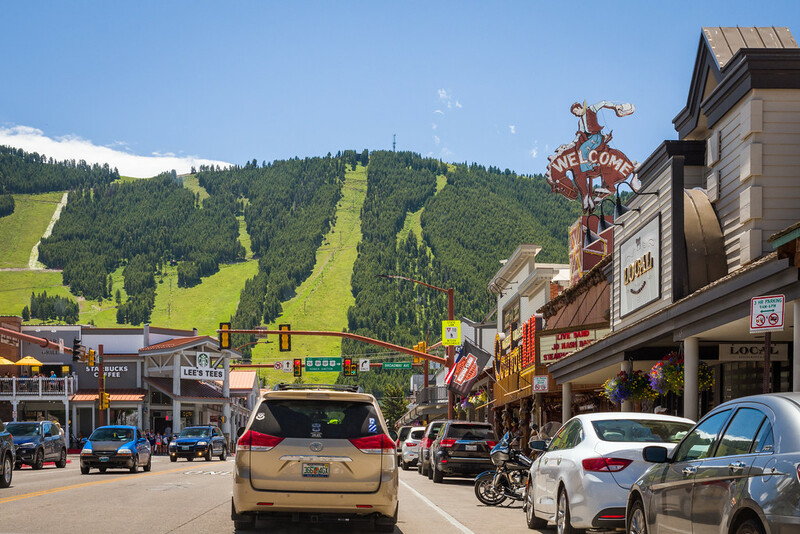 This would easily take us up to 8 o’clock, which is when the camp office at Colter Bay opens. Before we get on the shuttle and leave cellular range, I could call and ask for a late checkout. Unfortunately, Becky came up empty again. They only had stickers and fridge magnets, and everything else had sold out. We did, however, get OKed for a noon checkout! Awesome! Now we’ll definitely have time for a good hike. Round-trip fare for the shuttle boat across Jenny Lake was $15 per person. This seemed pretty steep for a short trip, but when you figure in the remoteness and the short four-month tourist season here, it’s more understandable. It would definitely save us time, too, as it shaved a six-mile hike to Inspiration Point or Hidden Falls down to only two miles round-trip. What really sweetened the deal was that they also sold Jenny Lake water bottles at the docks—so we had more water, and Becky finally had the gift she wanted for her bestie! 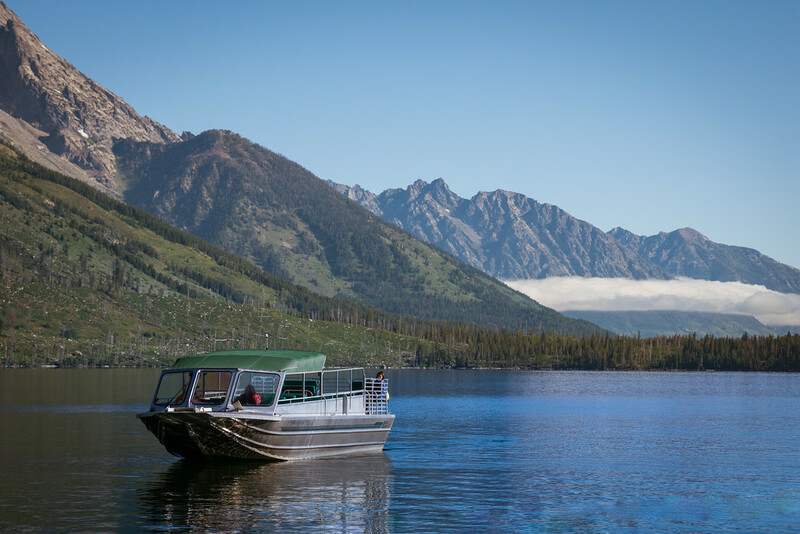 A shuttle boat head back to the docks by Jenny Lake Visitor Center. Becky enjoys the ride across Jenny Lake in the crisp morning air. The lake was very calm. Winds here seemed to be calm overnight and intensify with the sun throughout the day. 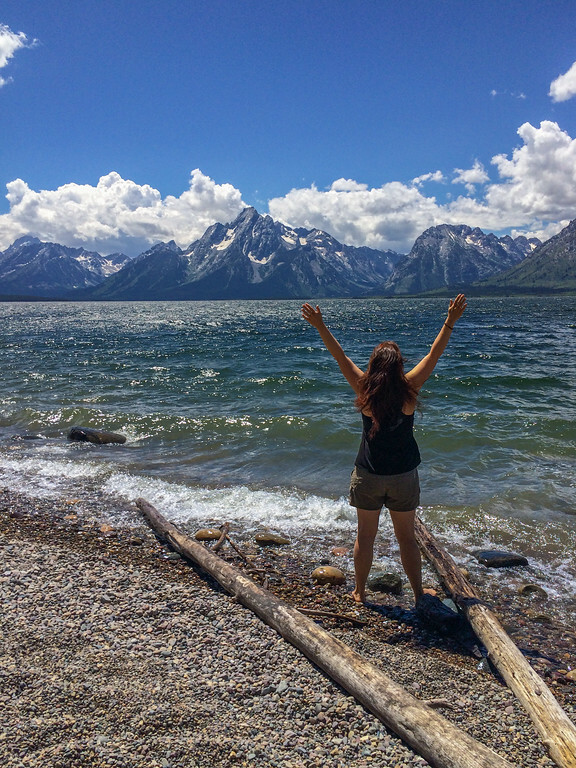 Becky said she heard that Jenny Lake is hundreds of feet deep, which would keep the lake from getting too rough for very long. This made for a smooth ride across. The overnight storm had also left behind some beautiful low clouds between us and Mt. Moran. I was a little torn between hiking to Inspiration Point or Hidden Falls. The driver taking us across shared that Hidden Falls was an easier trail but had no view, while Inspiration Point has an elevation change of 600 feet over the course of a mile and an extraordinary view at the end. We probably could have done both, but the trail in between was closed. I asked the driver how long it took to get to Inspiration Point, and he way very vague. It was pretty difficult to judge someone’s physical condition and acclimation to the altitude. He said it takes him about 30 minutes, and that most people should expect it to take at least 45 minutes. This sounded like it would work for our timeframe, which at this point was a little over 2 hours. Yes, folks, they say experience is the best teacher. On certain days of this trip, we’ve definitely had an experience that taught us something we’ll never forget. Back in South Dakota, we learned that it’s really nice to have a contingency plan if a thunderstorm rolls through when we’re camping on the Great Plains. Just a couple of days ago, I learned that my lack of planning can easily result in an overtired and unhappy Becky. And this morning, I learned something about spending time at altitude that I will never ever forget. I suppose the “they” who said that experience is the best teacher could also say that travel is the best way to gain experience. 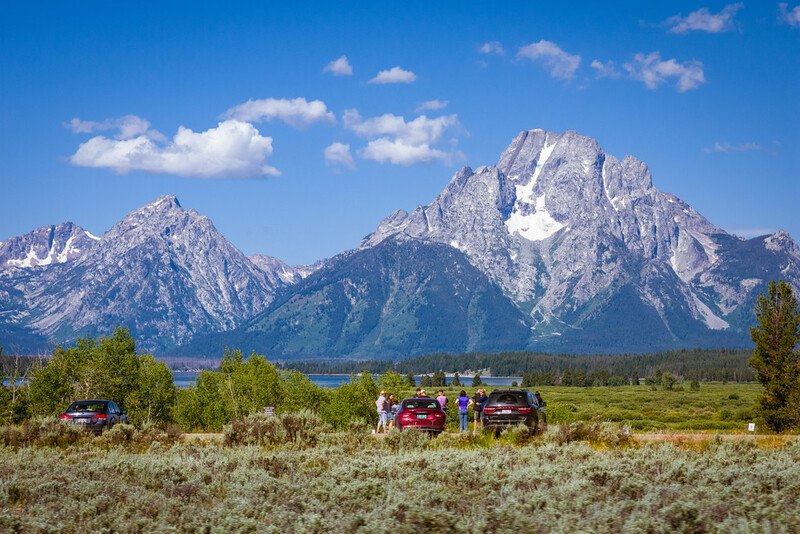 Yesterday we left Yellowstone National Park and set up camp in Colter Bay Campground in Grand Teton National Park. It was a smooth and uneventful day beyond a little sightseeing. We spent most of the day relaxing and just setting up camp for the next couple of days. We even got to bed at a good time, about 10pm. Aside from the headache I went to bed with, I felt pretty good, and just chalked it up to our altitude at 6,800 feet. Becky too wasn’t feeling 100% herself. Either way, I thought a good night’s sleep would have us feeling better this morning, and we’d get an early start. Well, we didn’t. I could have felt better, but I felt mostly OK. Becky wasn’t feeling all that great. 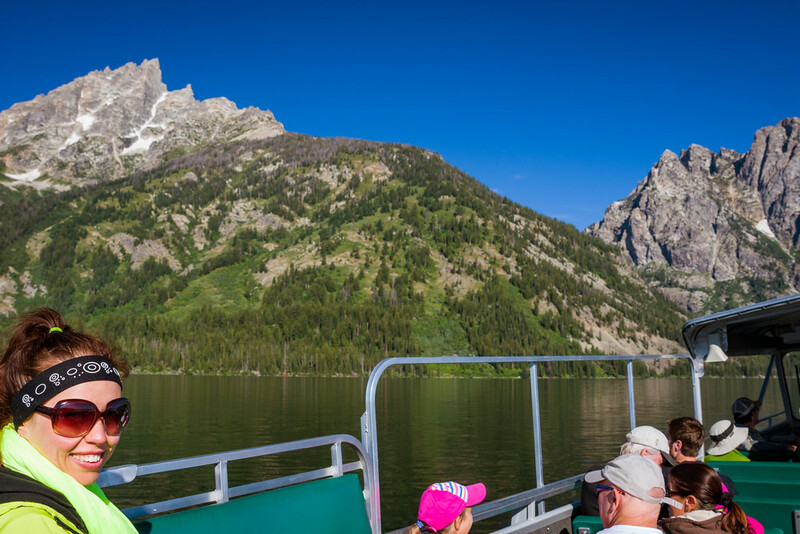 So rather than arriving bright and early at Jenny Lake to take a shuttle boat across to hike Cascade Canyon, we slept in. This sounds nicer than it felt, since our air mattress was almost completely flat. Becky suspected a slow leak, but I thought tired batteries could also be the culprit. I think we finally got on the road around 10am. 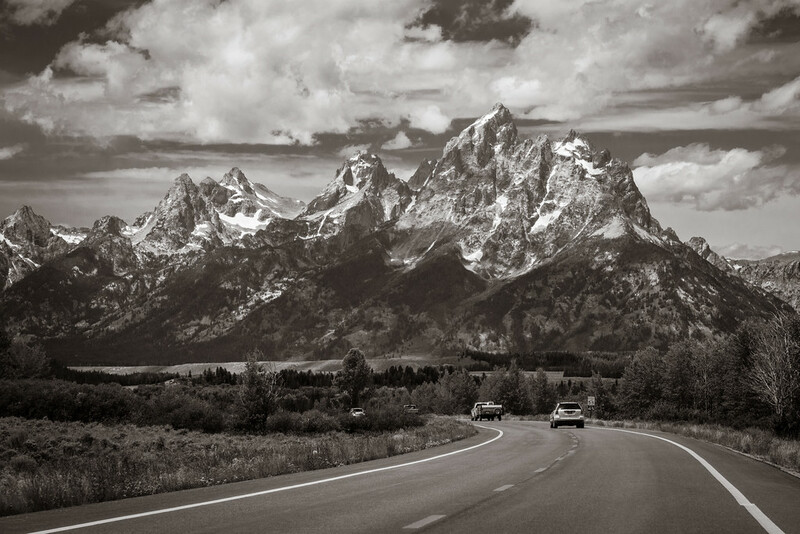 The views of the Tetons along the way were incredible! The morning sun lit Mount Moran and Grand Teton in a totally spectacular and yet totally different way than we saw near dusk the night before. At this point I was totally engaged in the scenery and my photography, as usual…and my morning meh feeling was no longer on my mind. We arrived at the parking area near the Jenny Lake Visitor Center and the place was completely packed. I knew this was a popular area, but I had no idea how much demand exceeded supply. As Becky drove around the parking lot hunting for a space, I began feeling more and more woozy. I’m sure winding around wasn’t helping, but my heart was starting to beat faster now too. After we passed Willow Flats I noticed I felt a little short of breath and used my albuterol inhaler which helps with my asthma. That can raise my heartbeat, but not usually this much. Things did not feel right and seemed to be getting worse. I told Becky that she had to stop the car. Since there were no parking spaces anywhere in sight, she was a little confused. I told her to just stop somewhere that cars could still pass, because I felt terrible and needed to stop moving. Old Faithful was the last sight we saw in Yellowstone before we packed up at Grant Village and moved on to Grand Teton National Park. After we scored a campsite, we relaxed along the shore of Jackson Lake and had dinner. Our nightcap was a short drive up to the summit of Signal Mountain. After spending a lot of time cleaning and drying off our tent when we packed up at Canyon Village the day before, I woke up at 5am this morning in Grant Village to the sound of rain on our tent. 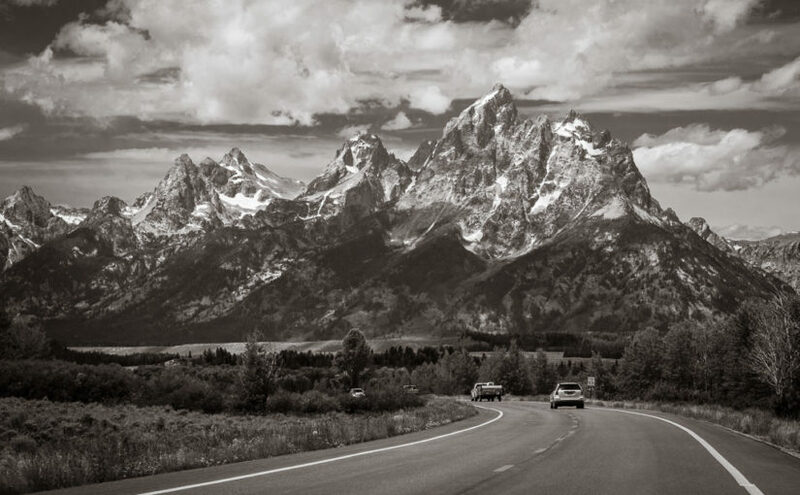 I was already plenty anxious about getting an early start and moving down to Grand Teton National Park today. 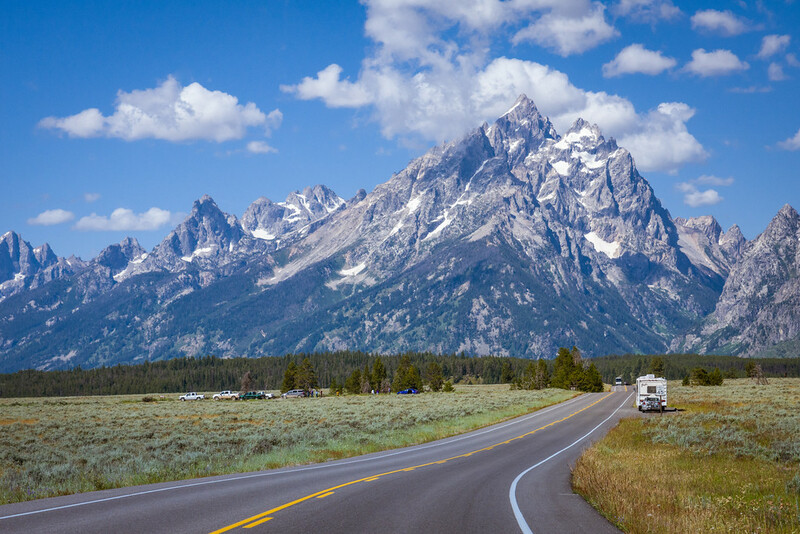 I was especially nervous about moving because all of the campgrounds at Teton are first-come, first-served so we had no reservation. I wanted to be completely packed, go see Old Faithful, and then beeline directly to our next campground as early as possible. Having to dry a wet tent all over again could jeopardize getting our next campsite. Boy was I annoyed. As the rain continued to fall and I continued to stew, I expressed my irritation to Becky. She told me that all that negative energy and anxiety did absolutely nothing to help us, and that it robbed me of enjoying things. “Roll with the punches,” she said. I realized she was absolutely right. So even though the rain hadn’t stopped, I took my wife’s sage words to heart—I stopped stewing and started thinking. I suggested that we get up right now, go see Old Faithful erupt, and then hopefully come back after the rain to a dryer tent to pack up. Becky dug the idea so we got up at about the same time the rain stopped. We shuffled off to the restrooms and got on the road at about 6:30am for the 35-minute drive to Old Faithful. The Grand Loop Road passes below the overpass for the Old Faithful Road. Old Faithful steamed quietly when we arrived. 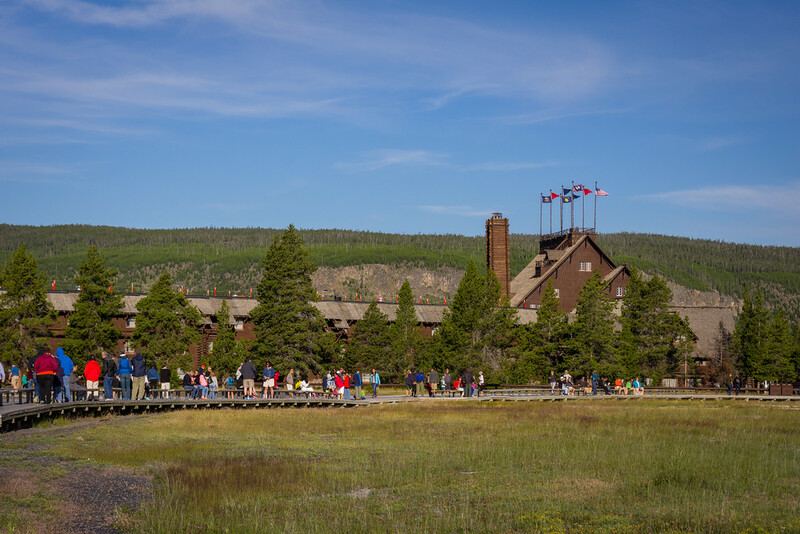 People begin to disperse after an eruption with the historic Old Faithful Inn as a the backdrop. Old Faithful is by far the most famous and most popular attraction in Yellowstone National Park. 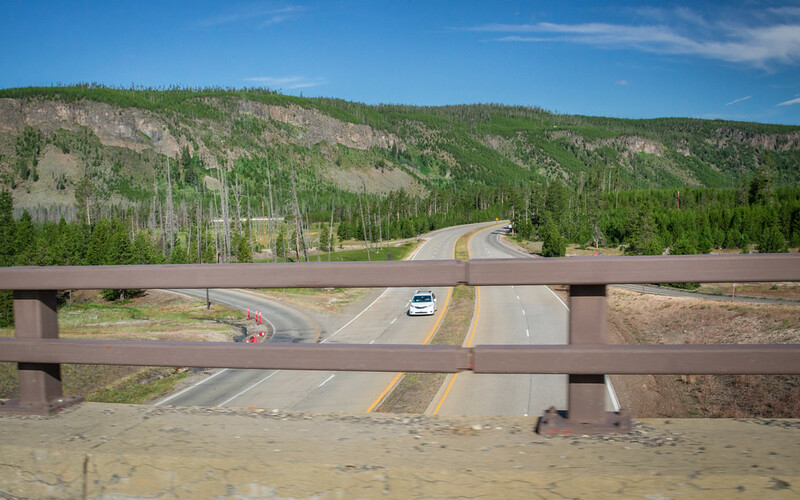 The otherwise two-lane Grand Loop Road actually widens to four lanes with a freeway-style trumpet interchange that takes you into Old Faithful Village. 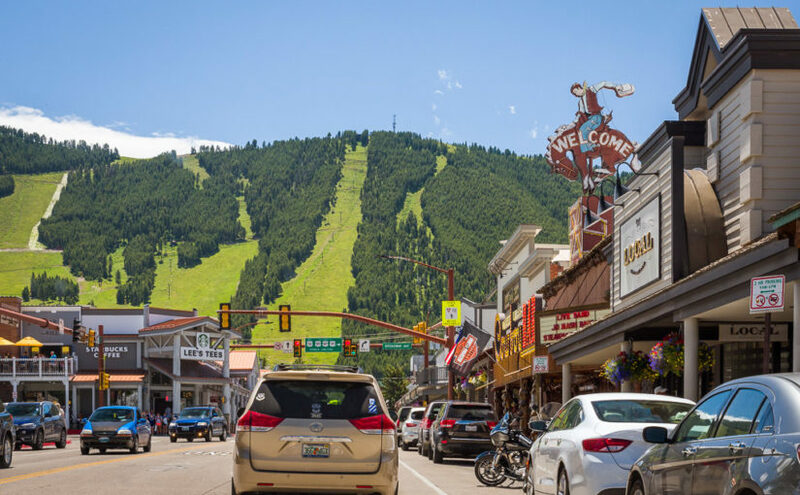 It’s so strange to see such urban infrastructure inside such a wild and vast national park, but it makes sense to keep traffic moving in order to minimize air pollution in this pristine place. 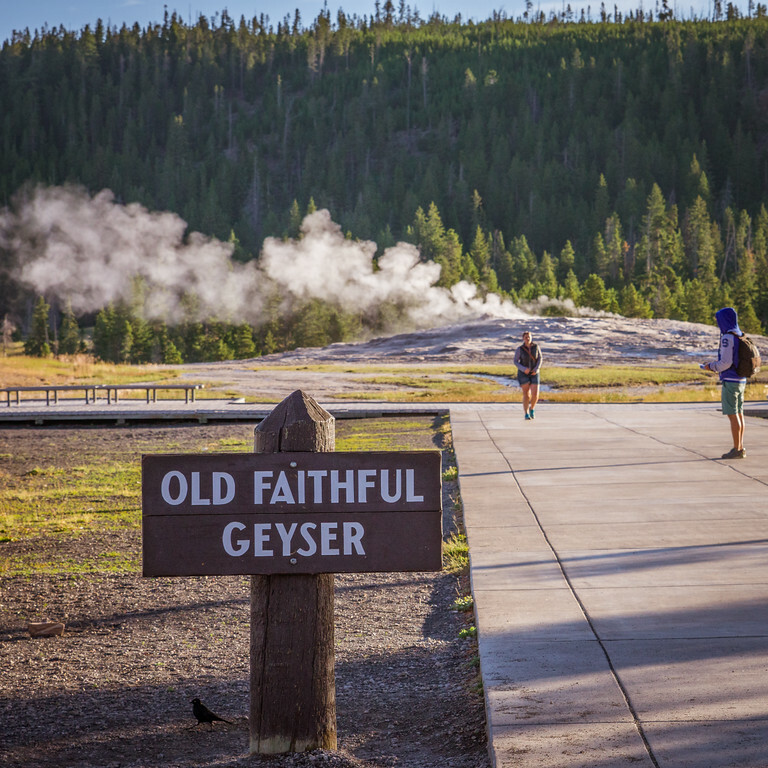 Besides the geyser, Old Faithful Village itself is quite extensive. There are a few stores, restaurants, and lodges here, including the historic Old Faithful Inn. 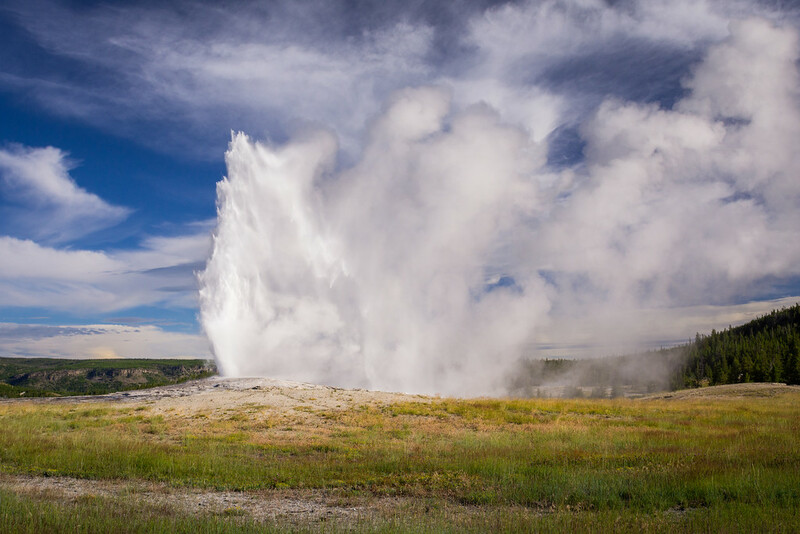 The visitor center sits only one or two hundred yards from the geyser everyone wants to see. We arrived here at about 7am and checked for the next predicted eruption time. Unfortunately, the visitor center doesn’t open until 8am, and the time posted in the window was from just after close the night before. So we were here, but we had no idea when the next eruption would be…but I didn’t panic, since there weren’t any people gathered as if it was about to blow. Finally, I found a sign that said I could find geyser eruption predictions at @GeyserNPS on Twitter. I pulled out my phone and hoped for good cell service… Huzzah! The feed predicted the next eruption at 8:12am, plus or minus ten minutes. I also found out I could call a number for other geyser predictions. To say that Yellowstone has geysers is an understatement. When we drove around the park yesterday, we realized that there are not just a few geysers, but that there are a few geyser basins that each have several geysers! Old Faithful is only one of many steaming holes in the ground that erupt hot water every so often in what is called the Upper Geyser Basin. So since we had plenty of time before we needed to stake out a particular spot, I called the prediction number to find out if any other geysers were expected to erupt nearby. It turned out that Daisy Geyser may be a possibility, so I made sure we picked a vantage point where we could see both in case they went off at the same time—how cool would that be! A fun fact about Old Faithful is that it is not the largest, tallest, or hottest geyser. It is, however, the most dependable big tall geyser in the park. It has been erupting about every 90 minutes for years, with varying heights of a few dozen feet to 200 feet. While you can’t quite set your watch to it, its dependable vertical spectacle is how Old Faithful earned its name and its spot as the top attraction in the park. Old Faithful erupted for us right on time at 8:05am. I’d read that Old Faithful often “plays” a bit with smaller eruptions, but there was no play involved here. About a minute or two before water burst forth, the geyser bellowed much more steam. The water pushed higher and higher, and then stayed at peak height for about a minute and slowly died down into a tiny fountain. Finally the water stopped and the geyser returned to just a steaming hole in the ground. We didn’t see Daisy erupt, but Old Faithful was very cool all by itself. 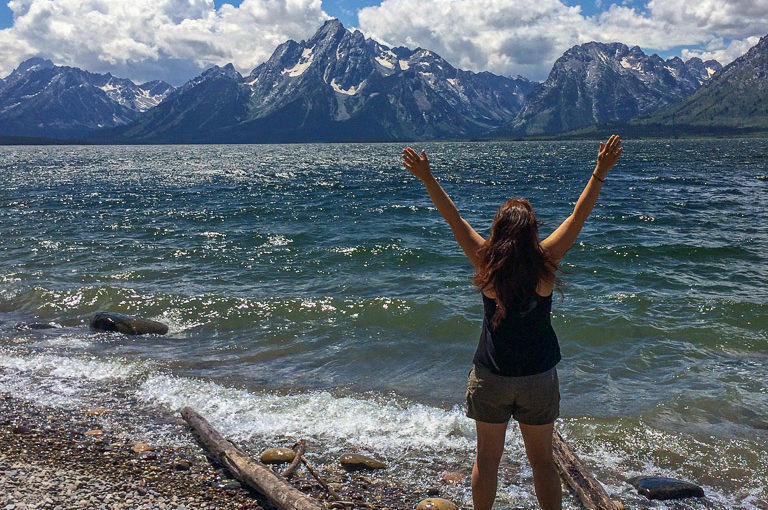 It was time to get back to pack up camp and move on in time to get a campsite in Grand Teton. My first choice of campground was Jenny Lake, which was a good two hours away. I knew that was a longshot, but my backup campground at Colter Bay wasn’t much closer, and I was nervous both could fill by noon.